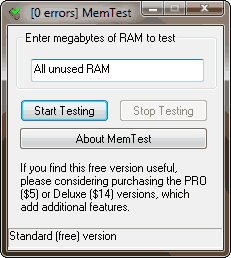 MemTest is a RAM tester that runs under Windows. It verifies that your computer can reliably store and retrieve data from memory. A correctly functioning computer should be able to do this with 100% accuracy day in and day out. A computer that fails these tests, perhaps because of old hardware, damaged hardware, or poorly configured hardware, will be less stable and crash more often. Even worse, it will become even less stable over time as corrupted data is written to your hard disk. 6.1 improvements to log file & added /alarm command line option. 6.0: optimized for computers with >4GB ram. Particularly significant for Deluxe users. If you are testing 8GB or more you need this version. If testing less than 4GB, 5.x may actually be slightly faster. Based on extensive empirical research we have updated the percent coverage metric; testing to 100% will catch all errors except for intermittent failures; to detect intermittent problems test to 400%. 5.0: 30% faster than 4.x!